Platform: BEAGLEBONE Black MICROPROCESSOR (revision C loaded with Debian Linux Wheezy 7), v3.8.13-bone63 kernel. Kennedy Data Systems is a Texas-based information technology corporation which provides user-friendly windows-based solutions that store data in a relational database which can be implemented in a standalone or client/server environment. The Remote Electrical Tilt Unit (RET) allows for the accurate control of antenna tilt, which eliminates the site-access requirement, allowing the tilt to be adjusted remotely from the base station/network control center in a matter of minutes. This allows for timely and accurate response to changing capacity requirements of the network. The solution is comprised of a motor-driven antenna with communication to the BTS via RS-485 and a microprocessor that controls the communication and performs supervisory functions. Most of the RET systems use the AISG protocol (Antenna Interface Standard Group) which is an open specification for the control interface of these systems. 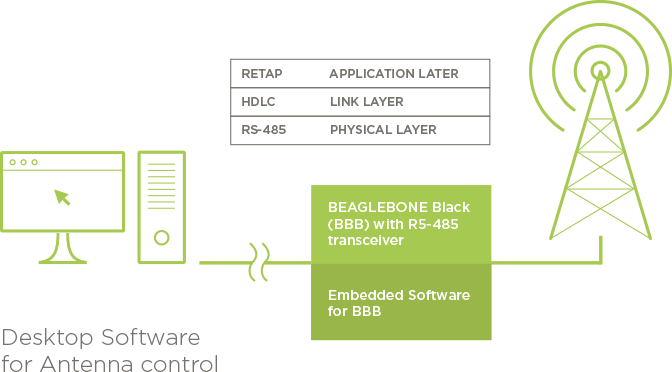 Our software solution facilitated the communication between a host computer and the motor-driven antenna through the RS-485 protocol and BeagleBone Black microprocessor performing control and supervisory functions. Our solution also provided a GUI host application software to support the test implementation.